Adelle Davis was born in Indiana and studied home economics at Purdue University. She received a bachelor's degree in household studies from the University of California at Berkeley in 1927. 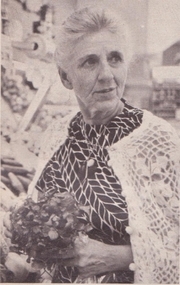 After receiving dietetic training at Bellevue Hospital and Fordham Hospital in New York City, she supervised nutrition for the Yonkers Public Schools north of NYC. She was also a consulting nutritionist for New York obstetricians. From 1931 to 1958, Davis was a private nutritionist in Oakland and Los Angeles, California. She received a master of science degree in biochemistry from the University of Southern California. In 1943, she married George Leisey, and adopted his two childrenl the couple divorced in 1953 and she re-married to Frank Sieglinger, a retired accountant and lawyer. Davis gained fame for her ideas about nutrition on the college campus lecture circuit, as well as in Latin America and Europe, and eventually became a sought-after guest for American television talk shows. She also participated in a medically-supervised LSD study and wrote a book about it under the pseudonym Jane Dunlap, Exploring Inner Space (1961). Adelle Davis is currently considered a "single author." If one or more works are by a distinct, homonymous authors, go ahead and split the author. Adelle Davis is composed of 2 names. You can examine and separate out names.